What is it about a horse that is so enamoring to a human? I think for all of us the answers are probably very similar, yet quite different and personal as well. One of my best detoxing methods is a horse. Often times when things are stressful at a show, I may take a walk out to the arena for a pet with a turn back horse. We both commiserate for a moment about how overworked and underpaid we are and in a few short moments all is right with the world again. For me, horses are mysterious. If I only needed a best friend, I could have a dog for that. But horses, horses are mysterious creatures chock full of life lessons. They are individuals. They are smart and kind (for the most part.) They can be quick and sometimes vicious when they have a point to make. And they are very stoic, sometimes to a fault. They teach us so much, that sometimes I wonder if we are training them or are they training us? I grew up on a cattle ranch and horses were an important part of our livelihood. We relied on them for both work and pleasure. My dad and granddad were partners and we had a pretty good sized remuda of ranch horses. However, as children, we were only allowed one horse. And we learned to take care of that one horse because we would not be granted another, period. If you were left afoot you were exiled to hoeing weeds, digging post holes or hauling water, until your horse was ready to ride again. 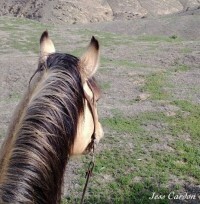 As I got older, and learned to appreciate the worth of my horses, I was granted more and more opportunities. We always had our colts to start and ride but we also had what we called our “town horses.” Your town horse was your best horse. When you went to the neighbors to work or brand calves, you always wanted to be mounted on your very best pony. There were basically two reasons to be mounted well. First, the cowboy culture has always been famous for competition. It was inevitable that a competition would break out sooner or later, either in the sorting pen or the branding pen. And second, a fine “using” horse could bring a cowboy instant respect and admiration. He was your signature. Therefore, he was your partner. So back to my original question: What is it about a horse that is so enamoring to a human? I think it all comes down to respect. Unlike a dog or cat, horses require a significant amount of respect. They rely and trust us to feed and take care of them but they will not let us get away with being disrespectful or unappreciative. Not all horses were cut out to be Olympic style jumpers or Cutting horses. Just like humans, some of us are just not athletically inclined. But they all have a spot somewhere with someone who can and should appreciate what it is that they can do best. That all boils down to a healthy respect and admiration for one another. Horses actually make us better people. So many lessons to be learned; cut corners or rush your training program and they will tell on you! Things will come unraveled like a cheap sweater. Beat on them, and well you better be careful as they outweigh you by a good portion. However, be diligent, do the work, mind your lessons and be rewarded as they give us their all and provide us with the best performances both in and out of the show ring. They are truly our silent partners.